Every day your drivers face a number of circumstances that can influence their trip - from traffic congestion and hours of service to the availability of parking. 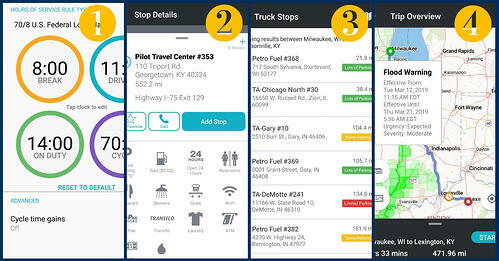 MileOn by PC*MILER empowers your drivers with the features they want and the tools they need. To get an overview, watch the video here. MileOn provides accurate ETAs for each stop along a route based on current vehicle position, available driver hours, and traffic conditions. Drivers can also visualize radar and weather conditions along the route to make informed safety and routing decisions - allowing your fleet to hit delivery windows and achieve exceptional customer service. MileOn by PC*MILER is a cost effective way to improve life on the road for drivers. A free trial offer is available for fleets. Head over to mileonapp.com to get started.